← Midsummer Scream 2017 Tickets on Sale Today! Throngs of fans headed to Disneyland for the 50th Anniversary celebration this weekend, showing their love of the classic attraction by wearing pirate hats, logo shirts, and all manners of pirate apparel. 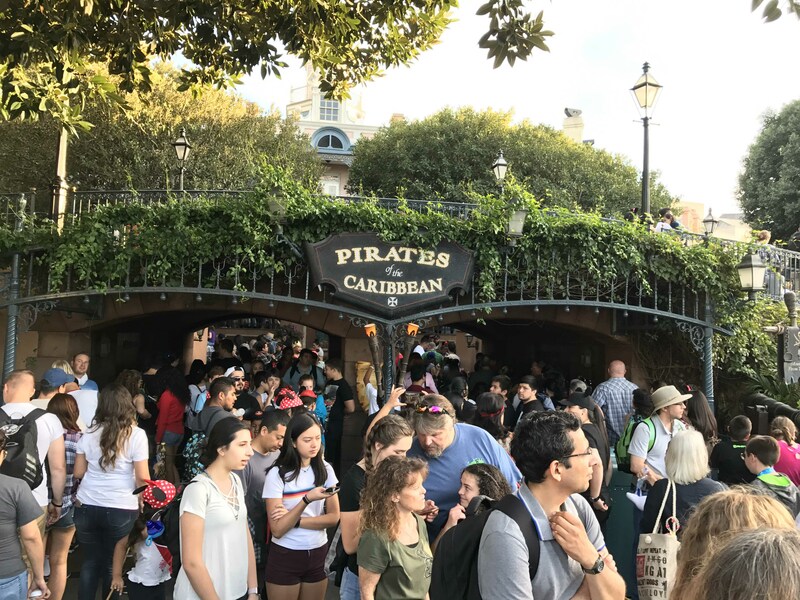 Wait times for Pirates – which has one of the largest capacities in the park – hovered between 1-2 hours each day, with the extended queue wrapping up and over the bridge in front of the attraction. By all accounts, Pirates of the Caribbean has never been so popular – and it appears ready to take on the next 50 years head-on! A full queue for Pirates of the Caribbean on Saturday, March 18, 2017 at Disneyland. I grew up with Pirates. My first trips to Disneyland began in the early ’70s, roughly 5 years after the attraction opened. Luckily, Pirates was my grandfather’s favorite ride at Disneyland, so it was our go-to whenever we’d visit The Happiest Place on Earth, which, seemed to be more often that perhaps most guests – maybe two or three times per year, if not more. Those first trips to Disneyland and introduction to Pirates marked the beginning of a lifelong love affair I’ve had with the ride. To this day, I firmly believe Pirates of the Caribbean is the greatest attraction ever built on multiple levels. It represents the Golden Era of Walt Disney Imagineering (WED back then as opposed to WDI, as it’s known today), when Walt Disney called the shots and assembled the greatest teams of talented designers and artisans the themed entertainment industry has ever witnessed. Despite the devastating loss of Walt in December of 1966, Pirates opened its doors at Disneyland just 3 months later to instant acclaim. For the next 50 years, it would go on to remain the greatest attraction the company has produced in scope and scale, and it continues to be an inspiration to designers and fans around the world. In the 1980s, I had the fortune of working Pirates of the Caribbean as a Disneyland Cast Member. It was then that my personal admiration of the ride grew by leaps and bounds, as I became intimately familiar with its inner workings and finest details. For someone who’d grown up a big fan of the attraction, there were no finer moments than walking on the deck of the Wicked Wench pirate ship in the Sea Battle scene, standing shoulder-to-shoulder with the Auctioneer, or sitting in the “tower” operating the entire attraction from its control panel overlooking the load/unload dock. 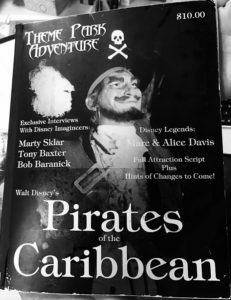 Shortly after I created Theme Park Adventure in 1994, I took on our first “Feature Issue” project: a 170-page historical book all about Pirates of the Caribbean. It remains one of the most exciting moments ever for TPA. Not only did we have the full support of industry luminaries such as Marty Sklar and Tony Baxter; I had the personal honor to work – and become friends with – Marc and Alice Davis, two Imagineering Legends who were key to the design team behind the ride’s success. Some 20 years later, that Pirates book is still brought up by fans and industry folks alike, which is very flattering. As I have said all along, the credit all goes to the men and women who created Pirates; all I did was put some of the history and stories together to preserve for fans well into the future. I am very excited to announce on this 50th Anniversary weekend, that I have entered into an agreement with the great team at Theme Park Press to revise and update my Pirates of the Caribbean book for the first time in two decades! It’s honestly, something I have said would never happen – so the lesson learned here is, never say never. The book will include approximately 80% of the original content, including interviews with Marty Sklar, Tony Baxter, Bob Baranick, and Marc and Alice Davis. I will be updating the text to include new quotes and comments from industry luminaries, more personal stories of what it was like to work the ride as a Cast Member in the ’80s, the inclusion of the Pirates of the Caribbean movie franchise into the ride, and a look at Shanghai Disneyland’s brand-new iteration of the attraction – Pirates of the Caribbean: Battle for the Sunken Treasure. Currently, “Pirates 2.0” is scheduled for a December 2017 release to commemorate the 50th Anniversary of the Disneyland attraction. I’ll have more information in the months ahead here on TPA so you can follow my progress of bringing this book back to life with the help of Theme Park Press! We rode Pirates last night after 11pm; the wait was still about 30 minutes or so, and the enthusiasm of fellow riders was palpable. Just back from a thorough “rehab”, Pirates of the Caribbean looks and sounds fantastic at 50. All of the show lighting has been adjusted and old/burned out bulbs replaced, the Blue Bayou once again has a good number of flickering fireflies, and the Creaking Timbers scene at the end of the ride is in full working order for the first time in a while. Nothing of note was added or changed – everything just looks really good, which is all we could really want. While I am not personally a fan of the inclusion of the film franchise elements into the ride, all of those components look brand-new as well, from the refinished animatronic figures of Captain Jack Sparrow, to the “waterfall” in the Trans Tunnel that Davy Jones appears through. It’s been a long time since Pirates looked so good, so definitely check it out soon if you didn’t get to the park this weekend during the anniversary celebration. There were a few disappointing aspects of Pirates’ 50th Anniversary for me personally, including a button that was handed out to every guest entering the park on Saturday. Rather than depicting a character or scene from the attraction itself, the button says, “Happy 50th” and is nothing more than an ad for the upcoming Dead Men Tell No Tales sequel. It’s a shame that the company opted to make that the button, instead of a heart-felt keepsake featuring the Auctioneer, or even the dog with the jail cell keys in its mouth. Not everything has to be a brazen marketing move, you know? We noticed a lack of high-quality merchandise commemorating the attraction’s 50th Anniversary. No special lithograph or sculpture piece in the Gallery, no limited edition watch with the 1967-2017 dates on it, or anything like the park used to do to celebrate milestones like this for its attractions. Considering Disneyland has done fairly elaborate anniversary celebrations for Pirates in the past, it’s really surprising that nothing like a rededication ceremony (dare I say even with Johnny Depp in attendance) with Imagineers didn’t take place to mark this momentous occasion. I’m holding out hope that we will see a roll-out of Pirates 50th Anniversary merchandise in the months and year ahead, just as the company did with the Haunted Mansion merch recently. If any attraction deserves a lot of really good merchandise, it’s Pirates of the Caribbean. It’s staggering to think how many people from all walks of life Pirates of the Caribbean has left an impression on. For those of us lucky enough to be from Southern California, this weekend served as a reminder of just how lucky we are to have this classic attraction quite literally in our back yard. From a project that started in the late ’50s as a walk-through attraction to a boat ride called the Blue Bayou Lagoon, Pirates of the Caribbean evolved into one of the most ambitious rides Walt and his team of Imagineers ever took on. 50 years later, Pirates still serves as a shining example of creative integrity, ingenuity, and daring design; it is as legendary as the men and women that breathed life into it all those years ago. Today, we raise a bottle of rum to the men and women who contributed to the greatest attraction the world has ever known! Here’s to the next 50 years! This entry was posted in Features, Home Page, Home Page Slider and tagged Disneyland Resort, Pirates of the Caribbean, Rick West. Bookmark the permalink. Interesting to note, despite the advances of technology today, somehow “Pirates…” still seems ahead of its time. 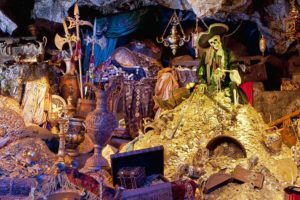 I often times put together a list of my all-time favorite DL attractions, just for the fun of it, and no matter how much I think it over, no ride ever surpasses POTC as my #12 Favorite. The Haunted Mansion has often times come close, ditto Indiana Jones…., but, man, if POTC still finds a way to stay at the top of my list.